The Cisco 2100 Wireless LAN Controller works in conjunction with Cisco lightweight access points and the Cisco Wireless Control System (WCS) to provide systemwide wireless LAN functions. As a component of the Cisco Unified Wireless Network, the Cisco 2100 Wireless LAN Controller presents network administrators with the visibility and control necessary to effectively and securely manage business-class WLANs and mobility services, such as voice, guest access, and location services. The Cisco 2100 Wireless LAN Controller supports up to six lightweight access points, making it a cost-effective solution for multi-controller architectures typical of enterprise branch deployments. It may also be used for single controller deployments for small and medium-sized business environments. 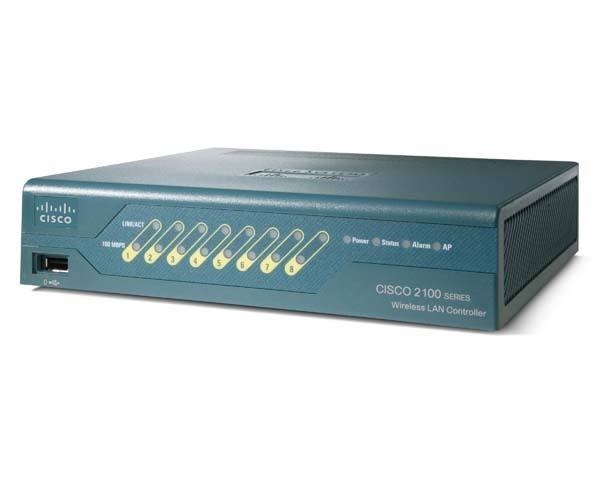 The Cisco 2100 Wireless LAN Controller provides eight Ethernet ports, two of which can provide power directly to Cisco lightweight access points. Provides eight 10/100 Ethernet ports, intended to support a combination of access points and redundant LAN uplinks. Two of the eight 10/100 Ethernet ports are 802.3af Power over Ethernet (PoE) enabled, rated for use with Cisco Aironet lightweight access points. Allows for convenient desktop mounting or rack mounting, with optional rackmount kit for flexible deployment. Wireless LAN Controller SeriesThe Cisco 2100 Wireless LAN Controller is a model in the Cisco Wireless LAN Controller family which includes standalone controllers, integrated controllers, and modular wireless LAN controllers that work in conjunction with Cisco switches and routers.